Looking for a ranch style vacation? 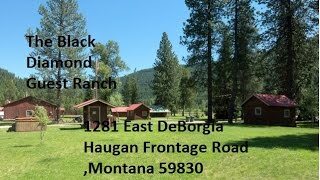 Stay in one of our log cabins at The Black Diamond Guest Ranch. Cabin 3 is one of six rustic log cabins at the ranch. Cabin 3 sleeps up to five guests and comes with log bunkbeds, handmade quilts, coffee maker, refrigerator, and one bathroom with a hot shower. Nestled in the historic district of DeBorgia/Haugan area. Surrounding the ranch is the Lolo National Forest. At the ranch we have a main Lodge where guest have access to many of it’s features. In the lodge, there is a stone fireplace, pool table, Dish television, free movies, board games, commercial kitchen for rent to accommodate large groups, and more! Also at the ranch, we have: a bunkhouse vacation rental that sleeps up to 17 people with a fully equipped kitchen; two soft sided tent rentals; space to bring your own tents; and full hookups and self-contained RV parking, or you can pitch your own tent. The Black Diamond Guest Ranch offers year-round activities. Our guests love the horseback riding offered for ages 12 and older Ask us about our discounted ski and snowboard packages for the Lookout Ski Lodge nearby. Special discounts are available if you rent the entire facility. We can accommodate 37 in the cabins, 8 guests in the soft tents, plus extra guests can bring their own tent or RV. Accommodating groups from 45-200 persons, The Black Diamond Guest Ranch can customize an adventure to meet your needs! We also offer packages for weddings, fund raisers, anniversaries, family reunions, scouting, and church activities. Plan ahead and please contact us and we will help plan your stay so that you have the best Montana adventure. Along with horseback riding, there are also plenty of fishing and river rafting opportunities. Explore St. Regis and Clark Fork Rivers nearby. Take advantage of the chuckwagon barbecues & cookouts (see rates). We also have drop camps for hunters & anglers. Explore the famous Hiawatha Trail just down the road. Staying during the winter? We have snowmobile rentals right at the Ranch. Plenty of things to do in the area, any time of year! We will be happy to answer any of your questions. When you book with us ask about the discount for Look out pass ski packages and the Hiawatha Bike Trail. Earl Doc Blackmon. Awesome place to spend vacation and it's ran by some awesome people. Wendy Peters. Beautiful place! 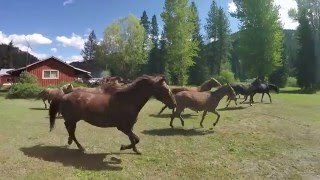 Love the horses, cabins, staff, food and the view! I would rather stay in the cabins and sit by a campfire any night than stay at any 5 star hotel! The Owner encourages all guests to visit our website and Facebook page to get a better feel for the Ranch. He wants everyone to know that we offer: rustic antique cabins that sleep 5 have been upgraded with all modern conveniences (hot shower, linens, pillows, bunkbeds, coffee maker, refrigerator); bunkhouse that sleeps up to 17 persons; full hook-up and self-contained RV spaces; tent campsites across the 40-acres of grassed lawn and meadow area; 2 soft-sided tents nestled in the forest just above the Ranch on “the bench”.